Northants all-rounder Steven Crook will retire from all forms of cricket at the end of the current season. Australian-born, the 35-year-old joined Northants from Lancashire in 2005, and aside from two years with Middlesex in 2011 and 2012, went on to spend the rest of his career at the County Ground. In all, Crook scored more than 5,000 runs in all competitions for the County, and also claimed more than 250 wickets, and was a key man in the Twenty20 title-winning teams of 2013 and 2016. Currently in his testimonial year, Crook has decided to call time on his career, and said: “It’s been an incredible ride living out my childhood dream of being a professional cricketer and I’m really proud to have played for such a long time. “I feel it’s the right time for me to hang up my hat and look forward to new challenges off the field. “There are too many people to mention individually but I want to thank all of my coaches over the years, support staff, team-mates, and particularly my friends and family. “I’d like to make a special mention to my mum and dad, brothers and my fiancé, Tamsin and daughter Marley - I wouldn’t have had the career I’ve had without their support. “I’d like to thank everyone at the club, all the supporters and everyone in the county who have made my time here so special, and I’m so proud to have been a part of the success that we’ve had as a team in the last few years. Crook’s abilities with bat and ball saw him become an integral part of the side that won promotion to Specsavers County Championship Division One in 2013, the same year as the Steelbacks won the first of their two T20 titles. With 46 not out off 24 balls and bowling figures of 1one for 32, Crook was named man of the match in the 2013 semi-final win over Essex Eagles, before taking two for 26 in the final win over Surrey later in the day. 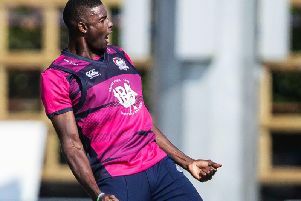 Three years later Crook was at it again in the same competition, taking three for 28 in the semi-final win over Nottinghamshire Outlaws – along with a three further catches – and then another wicket in the final against Durham Jets. Crook was awarded his County cap in 2013, and head coach David Ripley, paid tribute to thje player’s contribution to the cause at the Wantage Road. “Steve’s been a superb player for us,” said Ripley. “He’s been an integral part of the clubs success over the past six years, playing a major role in winning the T20 titles in 2013 and 2016 as well as the all round effort he made to help us gain promotion in 2013. “He’s a great character to have in the dressing room and is a positive influence on the players around him. Northants have two matches remaining this season, both in the County Championship. They have a trip to Gloucestershire on Tuesday, and then wrap up the campaign with a County Ground date against Sussex which starts next Monday (Sept 24).